Friends are searching for AirAsia Career in India? And your height is not proper for the cabin crew jobs? then don’t worry. Here is a piece of good news for you. Recently, Air Asia Job Vacancy has been updated on the AirAsia Career website for ground staff. As a ground staff of these airlines, you will get a chance to work inside the Indian Airport. 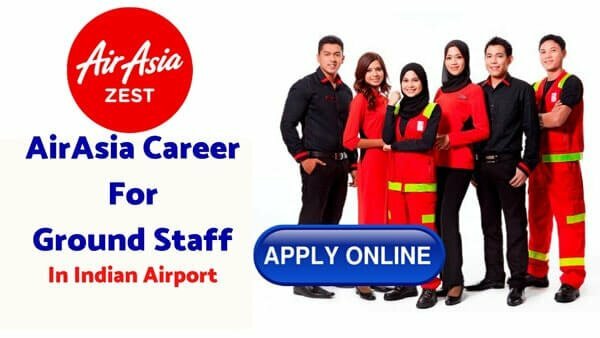 So, if you are interested in AirAsia job as a ground staff. Please read this article till the end to apply for this job online. Bellow are the vacancy details of AirAsia India career for Ground Staff. The aircraft is maintained according to the requirements of the required documents and other regulatory requirements. requirements in the most efficient and economical manner. Ensure aircraft are dispatched in a timely manner and with the highest technical efficiency and safety standard. Manage the pool of technicians and mechanics. Ensure that all aircraft documents and reports are properly recorded, accurately and immediately presented. This allows ensuring that all the defects have been corrected and work is done according to the current airplane manual. Ensure proper documentation / label is available for all components installed/removed. Responsible to ensure data entry is carried out in AMOS upon completion of every task. Ensure a high level of work quality and productivity of each staff. Ensure all parts/spares taken from the store are recorded as required. To carry out any other tasks as assigned by the aircraft maintenance technician. CAR 145/CAR M/MOE/CAME / FTS /RVSM PBN/Refresher training. Team worker, Aircraft Dispatched on time with higher technical efficiency and safety standard, correct spares/tool requisition. 5 Years/4 Years Maintenance experience as per para A2 of CAR 66.A.30. Note – To apply for this job online click here. also, here is some interview question list which will help you to get passed this interview. Ensure correct flight is displayed on FIDS. Follow up on PIR i.e. Tracing, Calling & updating passengers. Check BTS report for mishandled cases and follow up on BAH cases. Ensure departmental KPIs are achieved. Ensure security questions are asked and be vigilant at all time. Replenish and monitor stationeries, ED cards & etc. Ensure check-in counter and the gate is tidy. You should ensure cleanliness and tidiness of work area and backup room. Ensure no third party check-in and check passengers’ cabin baggage. Be vigilant to check visa validity. To perform cash collection at sales and excess baggage counter. Ensure sales drop is correct and issue remittance envelope. Report to Finance for discrepancy on short of cash. Ensure compliance of SOP and T&C. Promote and sell all ancillary income. Submit overtime claim forms to DE before the deadline. Attend to the guest complaint. Check passengers travel document and to positively identify passengers prior to check-in. To be emphatic and to have the initiative to assist passengers in Passenger handling and crisis management (Flight delays, cancellations). Ensure safety & security at all time. Work as a team and communicate well. Note – To apply for this job online click here. also, here you can download a professional resume or cv for your ground staff interview. Operates an effective stores system for materials management. Records all transaction details as necessary, i.e. Receiving, Issuance, Storage, Stock taking and Inventory data. Ensure storage facilities, environment and arrangement are properly set up by ensuring adequate condition preservation, handling, fast and accurate retrieving of spares in a secure and safe environment. Physical controlling and monitoring the movement of materials during issuance, receiving and dispatch from stores. Co-ordinates and process materials requisition including AOG request and preload. Assist Materials Executive and Store Inspector by maintaining, reviewing, updating and monitoring due date listing, update transaction for materials; ensuring the stock level is sufficient to support the operations. Liaise with Materials Executive and assist on maintenance planning functions, such as provisioning of materials for line check requirements and planned defect rectification. This is to ensure the efficient and highest quality services provided to end users. Update any discrepancies to Materials Executive. Responds to quality deficiencies in the area of activity for which he is responsible, which arise from independent quality audits. Responsible to ensure for the best possession of corrects skills, the best method, procedures, and requirement when handling materials. Adhere to all rules, regulations, and procedures regarding safety, housekeeping, and security. Attend and observe the daily or weekly Store Inspector briefing on the day’s activities. Follow such other duties, which are arranged on day-to-day activities by manager-logistics, content executive and store inspector. Any other Duty assigned by Manager – Logistics, or Materials Executive. Note – To apply for this job online click here. If you are searching for Cabin Crew jobs or Flight Attendant Vacancy please check those link for latest aviation jobs. Friends if you want to apply for AirAsia Jobs in India please click here to check from the company official website. If you are searching for any other airlines like Emirates airlines cargo agent jobs or Emirates cabin crew jobs or Etihad Airways careers please check the maintain links. So, if you have any more query to asking about AirAsia career for ground staff or related to Aviation, please comment below or you can contact me on my YouTube and Facebook page searching by the name of Aviation Dreamer. Which type of fuel is used in an airplane?